The Red Stick Ramblers On Mountain Stage In this encore presentation from Mountain Stage, the Baton Rouge band performs songs from its album, Made in the Shade. 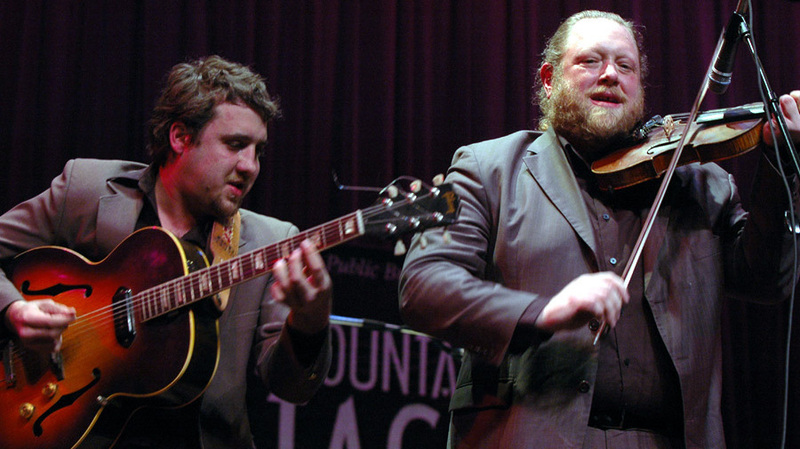 The Red Stick Ramblers performed on Mountain Stage back in 2007. "Keep Your Hands Off Of It"
Taking their name from their home city of Baton Rouge, La., natives The Red Stick Ramblers are heard here in a performance from 2007. Led by the twin fiddle attack of Kevin Wimmer and Linzay Young, along with Chas Justus on guitar and bassist Eric Frey, The Red Stick Ramblers meld the musical traditions of cajun, swing, gypsy jazz and southern honky-tonk. In 2006, the band joined Linda Ronstadt and Ann Savoy for her release Adieu False Heart, which earned a Grammy nomination. The Rambler's Mountain Stage appearance was in support of their album Made in the Shade, which was produced by Dirk Powell. Their most recent release, My Suitcase is Always Packed, features contributions by Mountain Stage regular Tim O'Brien. This set opens with an ode to one of the delicacies enjoyed by residents of Appalachia and the Gulf regions alike.